In the Iyengar Yoga system, classical postures (asanas) are taught with the aid of various props. 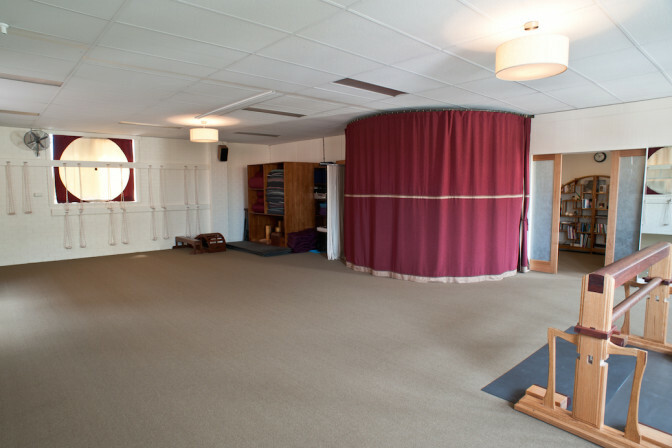 The unique and innovative use of props such as straps, blankets, chairs, bolsters (and other types), has made Iyengar yoga accessible to everyone, regardless of flexibility, age or health. Yogaha offers Iyengar yoga classes for students with all levels of yoga experience. We are located in the bayside area and easily accessible to areas such as Ripponlea, St Kilda, Elwood, Brighton and Elsternwick. All yoga equipment is supplied by Yogaha. Some students prefer to bring their own mats. Feel free to bring along your own mat if this is your preference. Please wear comfortable, loose clothing. During class, students are bare foot. It is important for the teacher to be able to see your feet, so please try to avoid wearing track pants that cover your ankles. Each class begins with asanas (postures) to loosen and stretch the body, followed by asanas to energise the body, and concludes with relaxation. It is very important that you inform your teacher of any injuries, ailments or medical conditions that may affect your participation and safety on the day. The sequence of asanas in Iyengar Yoga is important to the class structure and flow. If necessary, the teacher will alter any asanas, to suit your special needs; and monitor your progress. During a yoga class we exercise the internal organs. Please avoid eating a heavy meal less than 3 hours before class, as this will make you feel bloated. Yogaha offers Introductory Iyengar Yoga courses for students who are interested in commencing Iyengar Yoga. If you have any questions regarding Yogaha Yoga classes, please refer to our class timetable, or feel free to contact us at info@yogaha.com.au.